For those of you who are not from Ireland or have never visited, Ireland’s highest mountain is Carrauntoohil, which is 1038 metere’s high. 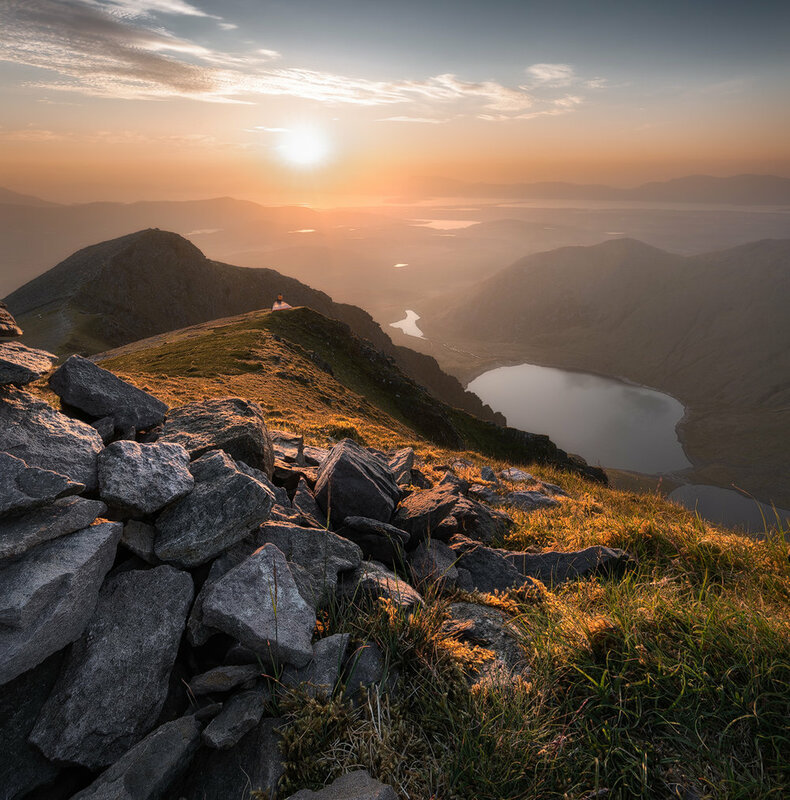 (3405 feet) Located in county, Kerry, the MacGillycuddy Reeks hosts the only 3 peaks of 1000 + meters in Ireland! This hike has been on my list for quite some time! I should add I’ve been living in Dublin, Ireland for the past 3.5 years! At any rate, the weather forecast was looking absolutely amazing. Clear skies predicted for both sunset and sunrise and great overnight temperatures. Highs were around 28 degrees celcius (82 Fahrenheit) during the day and 12 degrees by night (53 Fahrenheit). Now as a photographer, light is EVERYTHING! Needless to say bags were packed, plans were made, and a half day was taken off from work! My friend Max, fellow photographer/explorer, also joined me for this weekend adventure. We decided to take a different route up, “The Hydro Route”. Most people tend to take the “Devils Ladder” up (Around 12km return trip), as it is the quickest and most direct way up; however, due to this, the steep climb up has become extremely eroded, pretty much loose rock the whole way up. That route takes about 4-6 hours for a round trip, depending on one’s level of fitness! The Hyrdo Route is much longer and comes up almost behind the mountain,offering different scenery on the way up. This route has the option to hit all 3 1000 meter peaks and it starts with Caher, the third highest. Below is a map of route and also displays the devils ladder route. You can see there are two starting points, Cronins Yard and the Hydro Track car park. This route can continue on through the beenkeragh ridge and back to the Hydro car park (also known as the coomloughra horseshoe walk), or return via one of the other routes. As for us, we took the “zig zag route” down, which is near the devils ladder. It’s a big longer but it’s not as steep or rocky on the way down! From the Hydro Car Park we hit the trail. We were jam packed with gear, camera gear plus camping gear, etc. Between that, nearly 30 degree heat (86 F), and a steep incline for the first hour or so, the hike was pretty challenging. I only had a 2 liter bottle of water with me and I can tell you I was down to about half a liter by the time we set up camp! I had to pause quick a few times due to the heat and weight and thankfully stopped by Cottoners River to dunked my head in the water, which was beyond refreshing! After about 3.5 hours we arrived in the Caher area, where we set up our tent and got into position for golden hour and sunset! Views… I can’t express into words how beautiful it was up at 1000 meters! 360 degrees worth of the best views Ireland has to offer, at least in my opinion! Sometimes I felt that I was in a different country or even world! This weekend adventure was definitely a major highlight of my 4+years in Ireland. I can’t recommend it enough if you’re visiting. We tried to sleep for an hour or two but sleep never came. There was a full moon that night, so we got up and tried to take a few photos. Unfortunately it was a bit hazy and not as bright we had hoped. We quickly broke camp at 02:30, packed our gear, and hit the trail again! Sunrise was around 05:00 (5am) and the goal was to reach the summit of Carrauntoohil for it. With our headlamps (head torches) on we slowly and carefully made our way down a fairly narrow ridge. The path was easy to lose but we made it to the summit of Carrauntoohil well before sunrise. I of course had to touch the cross, which is sat at the very top! I’ll never forget that moment and looking out at the horizon. A red warm glow appeared. I sat in silence for quite some time, a sense of achievement and satisfaction, knowing I sat at the highest point in Ireland. I was in fact on top of Ireland! It also felt really good to take my bag off and to sit! We didn’t have dinner, lacked water, and sleep, but once the sun slide up over the horizon it all made sense on why we do this. Why we put ourselves through all of this. The views, the images, the sense of oneness with nature, and most importantly, the memories and stories that will last a lifetime. We were treated to a very beautiful sunrise that morning. That first light basked all of us with its warmth, illuminating the vast beauty that surrounded us. Again, words fail! It’s simply one of those things that has to be experienced for oneself! We slowly started out descent. As stated before, we took the zig zag route down, which led us to the Cronins Yard car park. (Same as devils ladder) from the base of the mountain it took around 40 minutes or so to reach the car park. Thankfully they served food and drink at Cronins Yard and the kind lady, whose name I do not know, was very kind to provide me with toast and tea, on top of refilling my 2 liter bottle of water, as I did not have any cash and was seriously lacking food and water after the past 24 hours. At this point Max was able to find a ride from a fellow hiker to reach our car in the Hydro Car Park. Max returned 30 minutes later to pick me up and off we went. The drive home was pretty long to Dublin. We were both pretty shattered due to not sleeping, lack of water/food, the heat, and the hike itself, but I can tell you right now that I would do it all over again for those views! Breathtaking!